Greece has made yet another other deal with the EU and IMF on its debt situation. Or rather as one EU official described it to the Financial Times “If it looks like we are kicking the can down the road that is because we are”. Said in another way, this is not really a deal to solve the fundamental problem, but rather a deal to avoid dealing with the fundamental problem. So what is the fundamental problem? Well, at the core of this is that the Greek government simply is insolvent and can’t pay its debts, but at the same time the EU is refusing to accept this fact. The IMF seems to understand this and probably so do the eurocrats, but politically it seems impossible to accept because that would mean the EU would have to accept that the strategy to deal with Greece’s problems has been wrong and it would mean accepting a major debt write-down on Greece sovereign debt something with likely would not be popular with voters in for example Germany or the Netherlands. Some are arguing that Greece haven’t done enough to solve its own problems and that letting Greece off the hook with a major debt write-down would just encourage even more bad habits and that is probably right, but it does change the fact that it is very hard to see how Greece will be able to pay of the debt. Furthermore, it is wrong when some are arguing that Greece hasn’t done anything. In fact, Greece has done more fiscal austerity than any other nation in Europe. 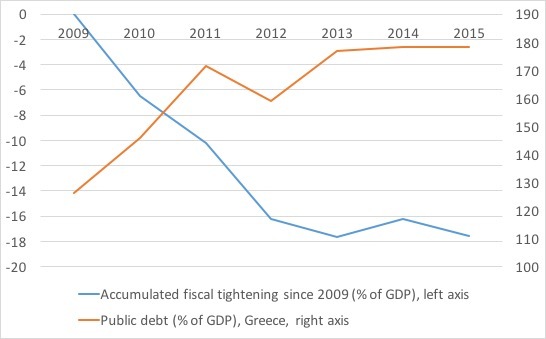 So if we for example look at the accumulative tightening of fiscal policy in Greece since 2009 then we will see that Greece in this period has tightened by 18-20% of GDP (measured as the accumulative change in IMF’s measure of Greece’s structural budget deficit). By any measure, this a massive fiscal tightening. However, one thing is the effort another thing is the outcome and here the story is quite different. Hence, since 2009 Greek public debt has grown from 108% of GDP in 2008 to more 180% of GDP this year. Hence, despite of massive fiscal austerity public debt has continued to grow every single year since 2008. The reason for this depressing development is the fact that Greece has seen a massive collapse in economic activity. 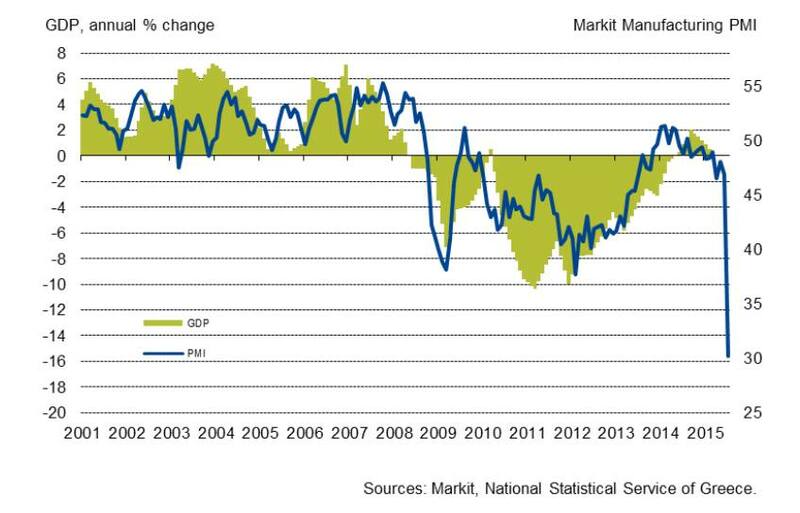 Hence, since 2008 nominal GDP in Greece has dropped by nearly 30%. A true economic disaster. No matter how fiscally conservative a country is it is impossible to stabilize the debt ratios with such an economic contraction. Therefore, to fundamentally solve Greece’s debt problem it is needed to solve Greece’s growth problem and that is not easy. Fiscal stimulus could of course be a solution, but Greece don’t have the money for that and the markets will not be willing to finance a fiscal stimulus package. Another solution is massive structural reforms and that is somewhat more promising that fiscal stimulus, but given the depth of the crisis even the most comprehensive reform package is not likely to be enough and that leaves on one solution – monetary easing. But since Greece is not in control of its own monetary policy because the country is a member of the euro zone that is not really possible either. Or rather it is – if Greece decides to leave the euro area. That seems like a very risky strategy, but it is blatantly obvious that this is really the only solution that would work. Therefore, it is not a question whether we will get a ‘Grexit’, but rather when it will happen. The German taxpayers will not forever be willing to pay the price for kicking the can down the road. PS Marcus Nunes also comments on Greece. PPS The IMF has a new paper, which once again shows that Greece is insolvent and urgently needs a debt write-down. The escalation of the greek crisis recently has made me think about the connection between the economic development, austerity and political uncertainty. Unfortunately we don’t have a commonly accepted measure of political uncertainty or political instability. However, I got an idea to make a simple measure of political instability in Europe. My idea is simply to count the total number of Prime Ministers, Finance Ministers and central bank governors a given country have had in a given period. A high number would indicate a high level of political instability. 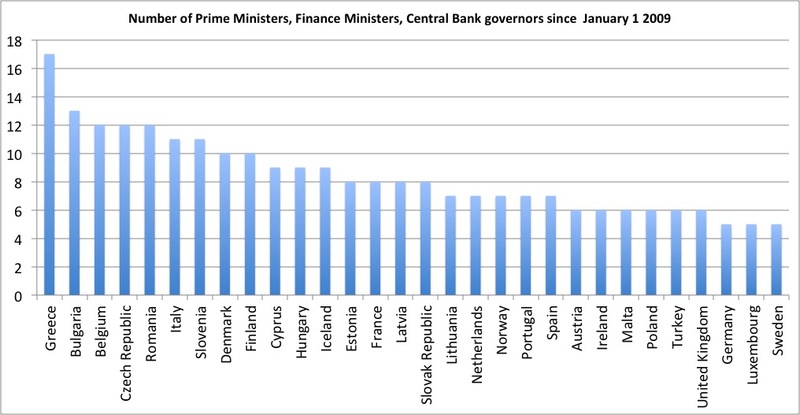 The graph below shows this measure for 30 European countries since January 2009. I have not done any deep analysis of the data so I am cautious not to make any strong conclusions based on what I have so far. 1) Greece by has been by far the most politically unstable country among the 30 European countries during the Great Recession. 2) All other countries are essentially within one standard deviation of the mean ranking. 3) There is no major differences between the political stability of countries with floating exchange rates relative to euro countries (and peggers). 4) Spain, Portugal and Ireland alle have been surprisingly politically stable during the Great Recession. Among the PIIGS only Italy comes close to the kind of political instability we have seen in Greece. 5) It isn’t surprising that Great Britain, Luxembourg, Sweden and Germany are among the most politically stable countries in the Europe. 6) However, Poland and Turkey have been remarkably stable in political terms. This will likely be a surprise to most people. Given what is happening in Turkish politics and recently geopolitical and military events the ranking could certainly be questioned. 7) Denmark and Finland have been surprisingly unstable politically during the Great Recession. Obviously this is a very simple measure of political instability and if one want to use the ranking more work on the index would be needed. For example, it is obviously that we might be more interested in looking at the change in the index rather than on the level of the index. Furthermore, some countries are likely “structurally” more stable than other countries. Should we account for that in some way? Finally I have not taken into account differences in electoral systems in different countries. That likely distort the data. If you want to have a closer look at the data see the Political instability Ranking. Any feedback is appreciated and I encourage my readers to play around with the data and develop it further. PS I have left out Switzerland of the ranking due to the fact of the large institutional differences in the way Swiss democracy works compared to other place in Europe. In my earlier post The Euro – A Fatal Conceit I argued that had the euro not be introduced and had we instead had freely floating exchange rates then “European taxpayers would (not) have had to pour billions of euros into bailing out Southern European and Eastern European government”. Said in another way had we not had the euro then there would not have been a European “debt crisis” or at least it would have been significantly smaller. A simple way of illustrating this is to have a look at the debt development in the euro countries (and the countries pegged to the euro) and comparing that with the debt development in the European countries with floating exchange rates. I use the same countries as in my previous post – The Euro – A Monetary Strangulation Mechanism. 21 euro countries (and countries pegged to the euro) and 10 countries with more or less floating exchange rates. The graph below shows the development in (median) gross public debt (% of GDP) in the two groups of countries. (All countries are hence equally weighted). 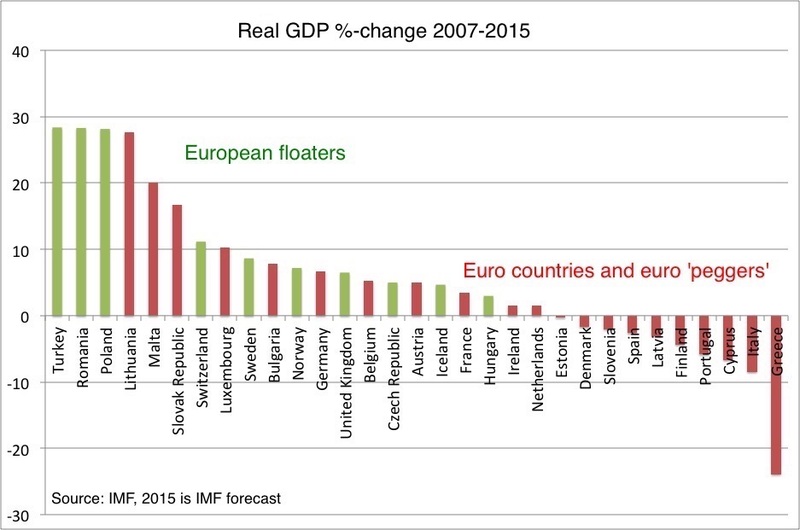 The picture is very clear – while both the floaters and the euro countries saw their public debt ratios increase sharply on the back of the 2008 shock (albeit less extremely for the floaters than for the euro countries) – from 2011 there is a very clear difference in the debt development. 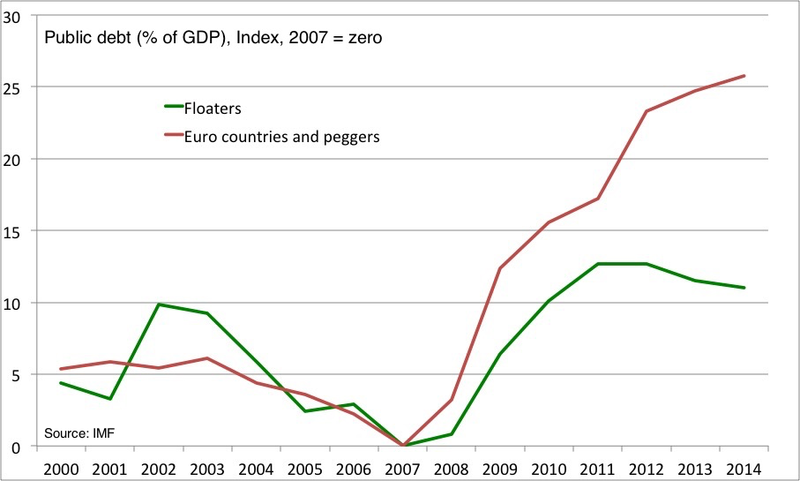 Hence, from 2011 the floaters have seen as seen a gradual decline in gross public debt (as share of GDP), while the euro countries (and the peggers) have seen a steep increase in public indebtedness. 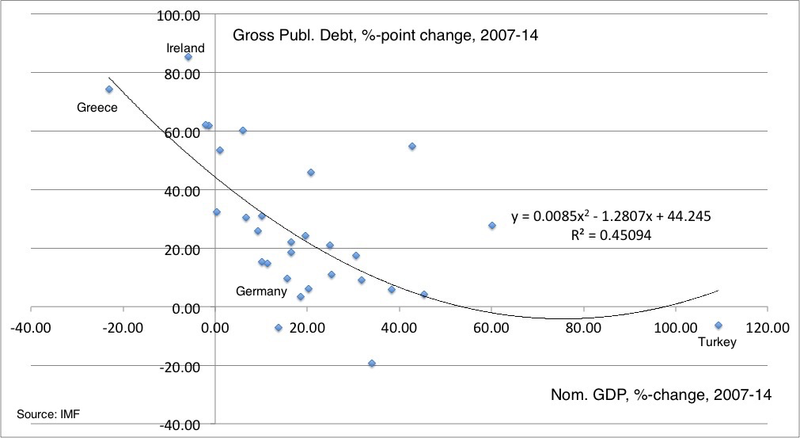 So while the floaters have seen their public debt increase by just above 10% of GDP from 2007 to 2014 the euro countries have seen a rise in public debt of more than 25% of GDP! The graph below shows the individual breakdown of the data. Again the picture is very clear – the euro countries (and the euro peggers) have had significantly more negative debt dynamics than the European floaters. 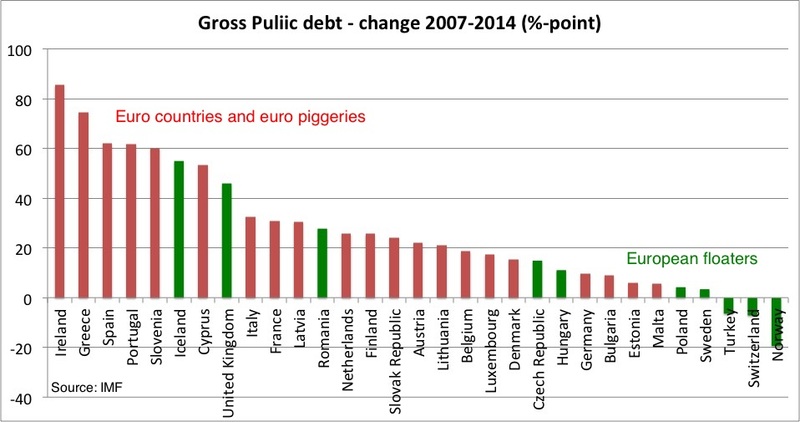 Even if we disregard the PIIGS countries then the euro countries are on average doing a lot worse than the floaters in terms of public debt dynamics . One could of course argue that the difference in debt development simply reflects that some countries are just less prudent than other. However, the graph below shows that this is not a very good explanation. The graph shows the annual change in the fiscal stance (measured as the annual change in IMF’s estimate for the structural public balance as share of GDP). Positive (negative) values are a fiscal easing (tightening). Second, it is notable that the fiscal stance of the euro countries and the floaters is highly correlated and is of a similar magnitude. This of course makes it even more paradoxical that the euro countries have had a significantly more negative debt dynamics than the floaters. So we can conclude that the reason that the euro countries’ debt dynamics are a lot worse than the floaters is not because of less fiscal austerity, but rather the problem seems to be one of lacking growth in the euro countries. The graph below illustrates that. The graph plots the debt dynamics against the growth of nominal GDP from 2007 to 2014 for all 31 countries (both euro countries and the floaters). The graph clearly shows that the countries, which have seen a sharp drop in nominal GDP such as Ireland and Greece have also seen the steepest increasing the public debt ratios. In fact Greece is nearly exactly on the estimated regression line, which implies that Greece has done exactly as good or bad as would be expected given the steep drop in Greek NGDP. This leaves basically no room for a ‘fiscal irresponsibility’ explanation for the rise in Greek public debt after 2007. This of course nearly follows by definition – as we define the debt ratio as nominal public debt divided by nominal GDP. So when the denominator (nominal GDP) drops it follows by definition that the (debt) ratio increases. Furthermore, we also know that public sector expenditure (such as unemployment benefits) and tax revenues tend to be rather sensitive to changes in nominal GDP growth. As a consequence we can conclude that the so-called ‘Europe debt crisis’ really is not about lack of fiscal austerity, but rather a result of too little nominal GDP growth. And who controls NGDP growth? Well, overall NGDP growth in the euro zone is essentially under the full control of the ECB (remember MV=PY). This means that too tight monetary policy will lead to too weak NGDP growth, which in turn will cause an increase in public debt ratios. In that regard it is worth noticing that it is hardly a coincidence that the ECB’s two unfortunate rate hikes in 2011 also caused a sharp slowdown in NGDP growth in certain euro zone countries, which in turn caused a sharp rise in public debt ratios as the first graph of this post clearly shows. Consequently it would not be totally incorrect to claim that Jean-Claude Trichet as ECB-chief in 2011 played a major role in dramatically escalating the European debt crisis. Had he not hiked interest rates in 2011 and instead pursued a policy of quantitative easing to get NGDP growth back on track then it seems a lot less likely that we would have seen the sharp increase in public debt ratios we have seen since 2011. Hence, if a country like Greece with a large current account deficit is hit by a “funding shock” as in 2008 and 2011 then the country will have to have an internal devaluation (lower prices and lower wage growth) and the only way to achieve that is essentially through a deep recession. However, that is not the case for countries with a floating exchange rate as a floating exchange country with a large current account deficit does not have to go through a recession to restore competitiveness – it just has to see a depreciation of its currency as Turkey as seen since 2008-9. Concluding, the negative debt dynamics in the euro zone since 2008 are essentially the result of two things. 1) The misguided rate hikes in 2011 and 2) the lack of ability for countries with large current account deficits to see a nominal exchange rate depreciation. We can therefore conclude that the euro indeed has been a Fiscal Strangulation Mechanism as fiscal austerity has not been enough to stabilize the overall debt dynamics in a numbers of euro zone countries. 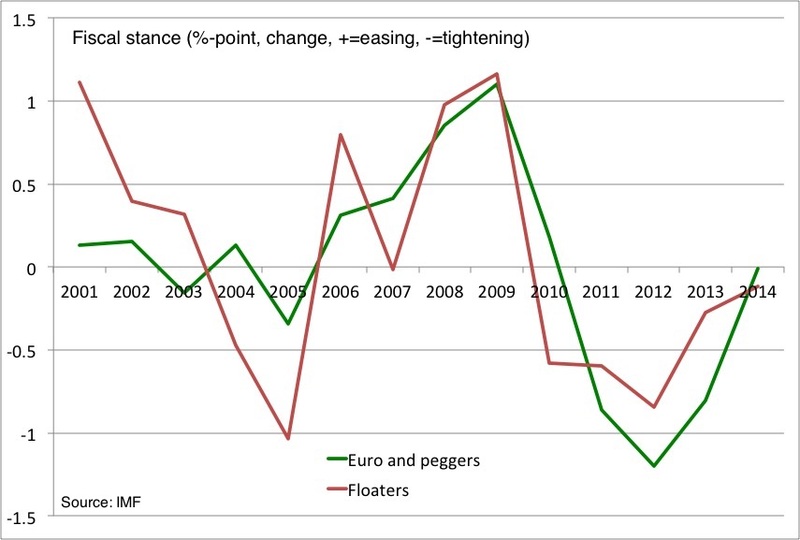 However, this is only the case because the ECB has first of all failed to offset the fiscal austerity by maintaining nominal stability (hitting its own inflation target) and second because countries, which initially had large current account deficits like Greece and Spain have not – contrary to the floaters – been able to restore competitiveness (and domestic demand) through a depreciation of their currencies as they essentially are “pegged” within the euro zone. PS I have excluded Croatia from the data set as it is unclear whether to describe the Croatian kuna as a dirty float or a dirty peg. Whether or not Croatia is included in the sample does not change the conclusions. Update: My friend Nicolas Goetzmann pointed out the Trichet ECB also hiked interest rates in 2008 and hence dramatically misjudged the situation. I fully agree with that, but my point in this post is not necessarily to discuss that episode, but rather to discuss the fiscal implications of the ECB’s failures and the problem of the euro itself.